Quotables: SALIERI: That was Mozart. That! That giggling, dirty-minded creature I had just seen, crawling on the floor! 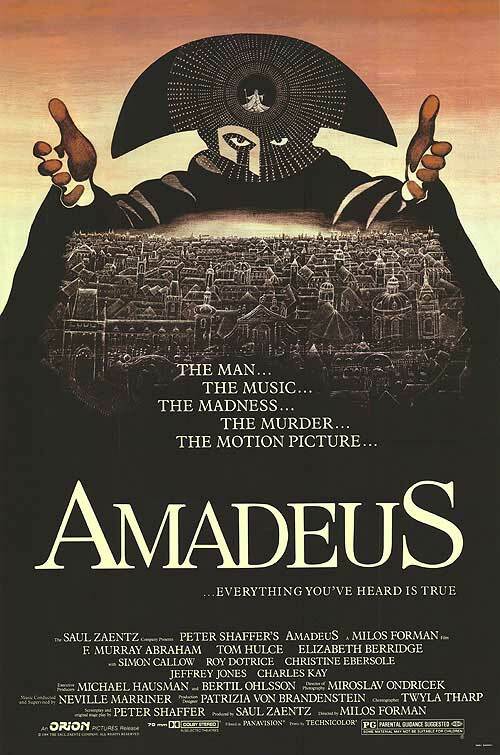 I don’t recall my opinion of this film the first time I watched it, but my god Tom Hulce does his level-best to make Mozart the most annoying character in cinema. I would rather listen to a million nails on a chalkboard than listen to his obnoxious laugh. That’s not to say that it’s not a good performance, but my god he’s irritating. F. Murray Abraham is excellent. What I find most interesting about this film is the hypocrisy. Salieri is furious that God would make Mozart “His vessel”, because Mozart is prideful and childish. Salieri has truly dedicated his life to being God’s vessel, but Mozart barely has to try to produce brilliance. However, what Salieri really wants is fame, and so he is jealous of Mozart, envious of his natural talent. They are both undesirable characters, but they are real.